Marinating salmon in homemade teriyaki, a quintessential Japanese sauce, is about as low-maintenance as you can get for a weeknight dinner. You only need to combine three ingredients for the teriyaki: soy sauce, sugar, and mirin (a seasoned Japanese rice wine). After marinating for a half hour or so in the sauce, your fillets of salmon are ready for two minutes in a preheated skillet under a hot broiler. Serve immediately with a side of veggies and rice. 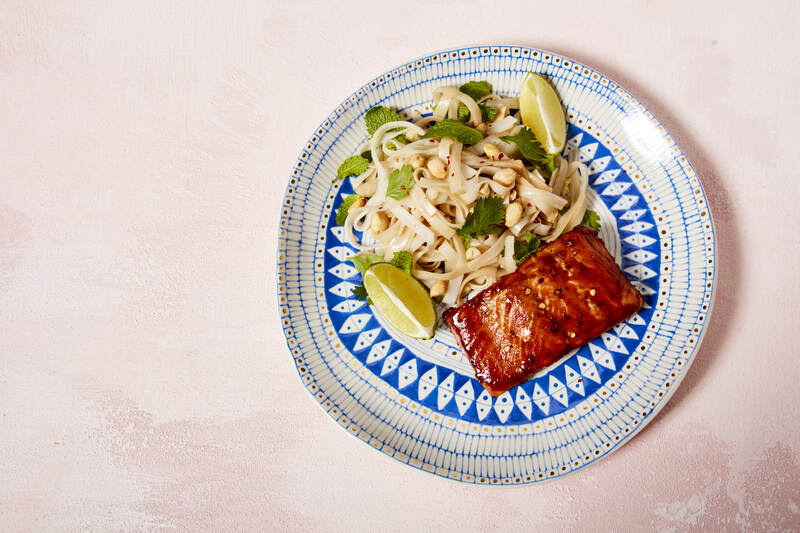 Salmon is the perfect counterpart to the savory spice of Thai green curry. The flavors of a Thai curry might be complex, but the dish is quite simple to make when you have the secret weapon: Thai green curry paste from a can or jar. The only other ingredients you’ll need? Coconut milk, some veggies, and a squeeze of fresh lime juice to pull the dish together. Tandoori-style salmon in a yogurt marinade is charred and spiced, yet cool and creamy. Save this dinner for a night when you can plan ahead a bit and spend some time in the kitchen: the salmon fillets are marinated twice in a 10+ ingredient mixture to maximize flavor, baked in a very hot oven, then served with a separate yogurt raita. Follow this recipe — but when using wild salmon fillets, cut the cook time down to 15 minutes. Fish frames add richness and body to the broth of ukha, a traditional Russian fish soup that can be made with salmon or any other number of ocean fish. The broth takes less than an hour to develop, and the salmon only another 10 or 15 minutes to simmer and cook through. Make a big batch of broth if you have space to spare in your freezer — that way, you’re already halfway to your next ukha dinner. This Japanese lunchbox staple is a cinch to make. You can replace the smoked salmon in this recipe with wild salmon that you’ve cured at home, or even well-seasoned cooked salmon leftover from your last salmon meal. Poach fillets of salmon in a quick coconut-mango sauce for a recipe inspired by easy, Caribbean cooking. If you like a little spice, feel free to add a few slices of spicy pepper into the sauce as it simmers. Serve hot with rice. A coastal country crossed by several rivers, Bangladesh cuisine revolves around fish. Naturally, they’re masters at the fish curry. You might need to pick up a few spices from the store that aren’t normally in your pantry, but the resulting dish is well worth the effort. Ever been to the Bahia region of Brazil? Sitting down to a big bowl of moqueca, a spicy, savory, and tangy fish stew from the Northeastern coast of the country, will make you feel like you have. This delicious recipe has been simplified so that any home cook can make it. Serve with rice, and if you’re feeling especially Brazilian, a side of toasted cassava flour called farofa. A simple, Italian Piccata dresses up your salmon in simple Mediterranean flavors. Lemon, white wine, garlic, and capers are simmered together in the pan juices of seared salmon fillets, then finished with a bit of butter. This fresh recipe is a surprising mashup of Jewish delicatessen and Vietnamese summer rolls. Feel free to sub out smoked salmon with slices of home-cured wild salmon and replace the crème fraîche with cashew cream if you want to make this dish an all-raw treat. This twist on a classic Greek salad features the rustic flavor of grilled salmon to make it a complete meal. If you haven’t cooked up salmon on the grill, you might be surprised to find out how easy it is to do. No grill? Substitute broiled salmon or salmon roasted on a cast iron grill pan.